How To Make Money Online ...:::: Earn Methods ::::... Why Google webmaster Sitemap, only the latest 26 Post of your blogger (Blog) are indexed upon Google sitemap submission, and Google sitemap not showing more then 26 post pages. Why Google Indexes Only 26 Pages? If you have more than 26 posts on your blog then Google wont be able to index the older posts correctly. after submit your sitemap at Google webmaster account, that only 26 (URL,S) are shown to be indexed on Google webmaster sitemap and not the Up Coming and New (URL,S) show on your blog,s webmaster index. Google crawlers are efficient of webpages everyday, but your posts are not show on your index, so Google crawlers not pick up your page to Google search engine. This problem are face to Blogspot blogs alone. highly affected are Blogger user who use a free service of blogger blogspot.com and Blogger are "UN optimized" platform in comparison to WordPress. blogger displays a list of only first 26 pages of your blog posts. because Google feed in XML format with backup of your all post,s are in your blog site. and Google sitemap are automatically generated when you create blogger blog on (www.blogger.com) platform. now i show u below what blogger need to show your all post on Google sitemap let see. Now you generate sitemaps for your blogger, blog follow these easy steps and generate Google sitemaps. 1: Go to your blogger dashboard and see how many posts are your list. 2: Count your total blog,s posts. The count is visible on your left side of your blogger dashboard. 3: If your total post are less than 500 then you must submit the code of sitemap. If your post are above 500 but less than 1000 then submit the following 2 sitemaps. So if your posts above than 1000 & less than 1500 then you will submit the following sitemaps, on your Google sitemap. now you have almost successfully and complete generated or created the sitemaps. now you submit this to Google webmaster. 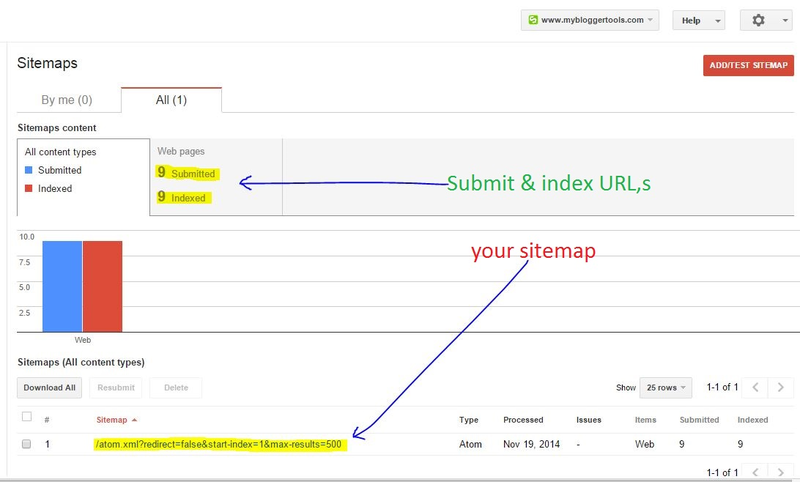 Submit Sitemaps to Google Webmaster. 1: Just Go To Google Webmasters tools. 2: Select your blogger blog on your blogs list. 3: search queries and sitemaps on your main of webmaster Dashboard page. 4: now just Click on the Link under the sitemaps report. 6: now you paste your first sitemap and then click (Submit Sitemap) Button. 7: Repeat this step if you require remaining sitemaps and all the sitemaps that you generated. 8: after three days Google webmaster crawl and index every single page of your blog. After one to four days you will find that all (URL,s) that you submitted are successfully indexed in Google webmaster. now you just want to look this report below. if you have any question about this tutorials don't hesitate to submit me your question. write your question on comments area.